CARFAX One-Owner. Clean CARFAX. 2016 Volkswagen Jetta 2.0T GLI SE 2.0 Certified. 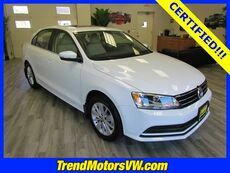 FWD 2.0L I4 TSI Turbocharged 6-Speed DSG Automatic with Tiptronic 24/33 City/Highway MPG * BACK UP CAMERA *, * LEATHER *, * HEATED SEATS *, * POWER SEATS*, * VOLKSWAGEN FACTORY CERTIFIED *, * CLEAN CARFAX *, * SUNROOF / MOONROOF *, * 1 OWNER *, * BLUETOOTH *, #Usedcars #Certifiedcars #Lowprice #Greatdeals #Volkswagen #Honda #Toyota #Ford #GMC #Audi #Buick, #Hyundai #Jeep #Landrover #Lexus #Mercedesbenz #Nissan #Scion #VWCPO #GREATDEALS #Blackfriday, Titan Black w/V-Tex Leatherette Seat Trim, 9 Speakers, ABS brakes, Alloy wheels, AM/FM radio: SiriusXM, Compass, Electronic Stability Control, Emergency communication system, Fender Premium Audio System w/8 Speakers, Front dual zone A/C, Heated door mirrors, Heated front seats, Illuminated entry, Low tire pressure warning, Power moonroof, Radio: Composition Media w/6.3" Touchscreen, Remote keyless entry, Traction control.